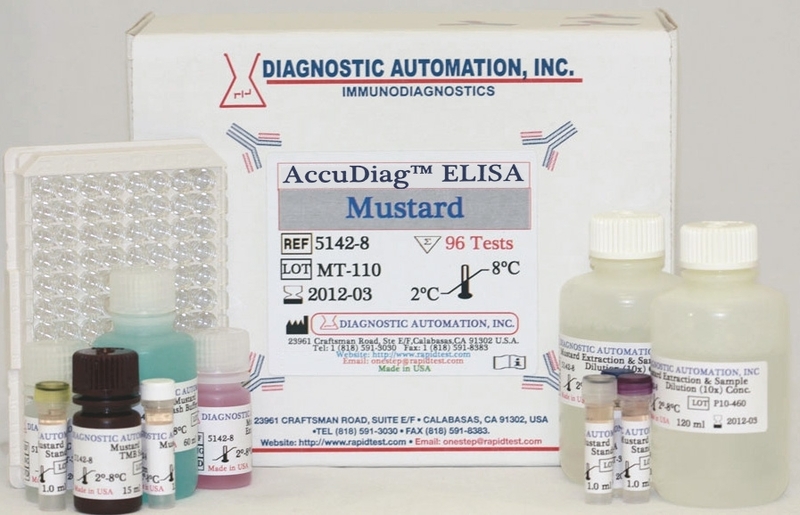 Diagnostic Automation Inc. offers a Mustard ELISA Kit that is an Enzyme Immunoassay for the Quantitative determination of Mustard in food. This Mustard ELISA Kit is a rapid and sensitive Food Allergen ELISA Kit which is designed to provide a sensitive and convenient method for screening food samples for mustard residues. The Mustard ELISA Kit represents a highly sensitive Food Allergen ELISA Kit detection system for yellow mustard and is particularly capable of the quantification of resides in sausage, dressings, soups, cheese, and mixed herbs. Mustard belongs to the Brassica plants. With about 30-35%, the fraction of proteins in mustard seed is very high. Some of these proteins are known for being allergenic, such as Sin a 1 and Bra j 1. These proteins are predominantly heat resistant making them stable to different production processes. In addition to brown mustard (Brassica juncea) and black mustard (Brassica nigra) primarily yellow mustard (Sinapsis alba) is used as an ingredient in many foods and food preparations. For mustard allergic persons, hidden mustard allergens in food are a critical problem. Already very low amounts of mustard can cause allergic reactions, which may lead to anaphylactic shock in severe cases. Because of this, mustard allergic persons must strictly avoid the consumption of mustard or mustard containing food. Cross-contamination, mostly in consequence of the production process, is often noticed. The sausage production process is a representative example. This explains why in many cases the existence of mustard residues in food cannot be excluded. For this reason sensitive detection systems, like this Mustard ELISA Kit, for mustard residues in foodstuffs are required. 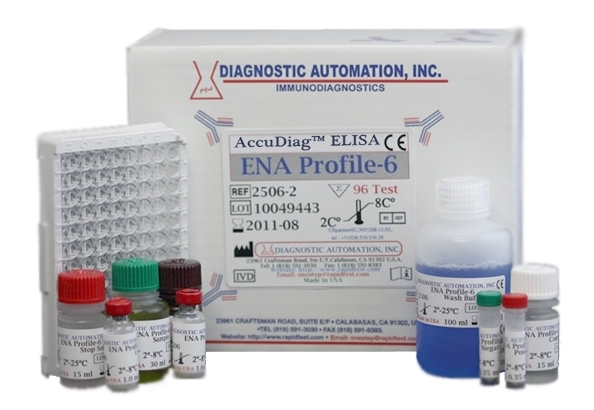 The Mustard ELISA Kit is a quantitative test based on the principle of the enzyme linked immunosorbent assay. An antibody directed against mustard proteins is bound on the surface of a microtiter plate. 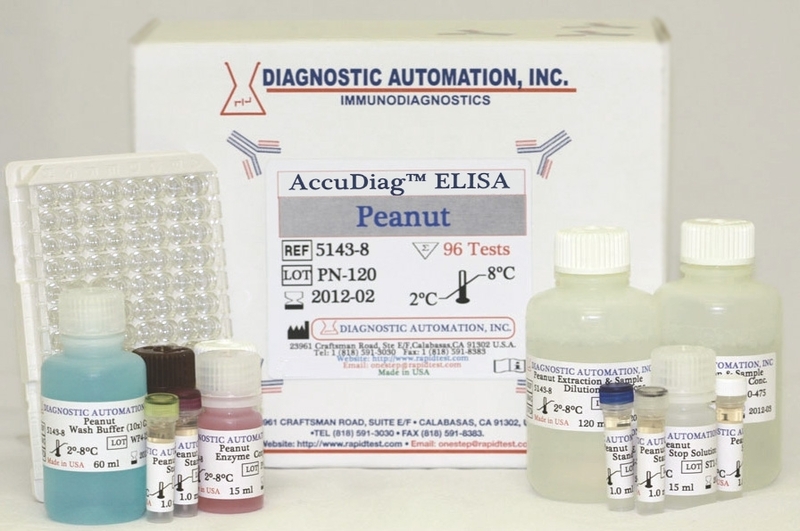 Diagnostic Automation Inc offers several popular Food Allergen ELISA Kits: Egg Protein Residue in Food ELISA Kit, Soy Protein Residue Detection in Food ELISA Kit, Lupine ELISA Kit, Peanut ELISA Kit, Soy ELISA Kit, Almond ELISA Kit, Gluten ELISA Kit, Walnut ELISA Kit, and Milk Protein Residue Detection in Food ELISA Kit. 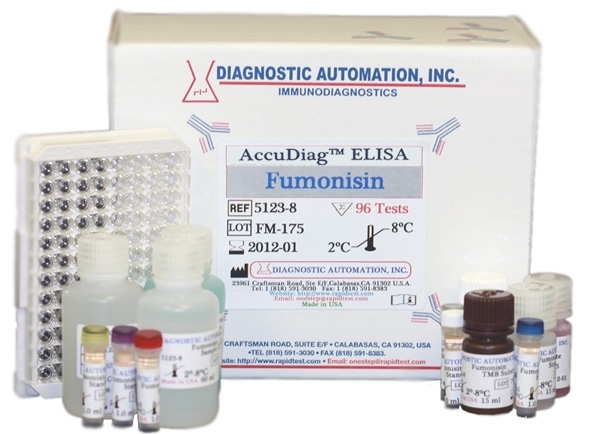 For more information on any of these Food ELISA Test Kits please see our website home page, or contact our Customer Service Representative at 818-591-3030. The limit of detection (LOD) of this Mustard ELISA test is 1 ppm. The limit of quantification (LOQ) of the DAI Mustard test is 2 ppm. Due to the variety of sample matrices and their influence on the blank, results less than the LOQ should be treated as negative.